Having to pause work to search for the right screw bit? With the Bosch PSR Select that’s a thing of the past. 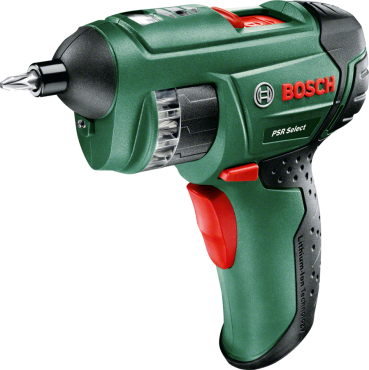 The Bosch PSR Select Cordless Screwdriver is small, lightweight and integrates 12 different bits for the most common screws, making it a convenient screw driver for all basic tasks around the house. Users don’t need to worry, as the tool is intuitive to use and allows for fast and easy bit changes. The PSR Select is a functional tool including a 3.6 V (1.5 Ah) Lithium-Ion battery for up to 90 screws with one fully-charged battery. The 4.5 Nm torque and the idle speed of 210 rpm deliver sufficient speed for various applications around the house. EasySelect Technology: The PSR Select integrates 12 pre-selected bits within the rotatable box. The tool might remind users of a revolver, just with screw bits instead of bullets. To select the right bit, simply rotate the box until the bit appears in the window on the top of the tool. An integrated LED lights the bit on top to help you find it even quicker. By pushing the lock switch next to the window away from your body, the bit drops out immediately. To change the bit, simply push the lock switch in the opposite direction and the bit goes back into the box, which can then be rotated again. Versatility and Comfort: The Bosch PSR Select is delivered with the following most common and useful bits (including the IKEA bit): PH0, PH1, PH2, PZ1, PZ2, S4, S6, T10, T20, T25, H4 and H5. These can be used for screws up to 5 mm diameter. While the battery lasts for up to 90 screws, a charging time of just 4 hours is sufficient to fully recharge the lithium-ion battery, which maximises the versatility of the 500 g lightweight tool. Integrated PowerLight: The integrated PowerLight is a built-in LED, meaning the work piece is always well lit and clearly visible. Battery Charge-Control Indication: The battery charge-control indicator LED on the top of the tool indicates the charge condition of the battery and turns red as soon as the battery needs to be connected to the charger again, either completely or in intervals. Forward/Reverse Indicator: Users are able to screw in both directions. The green direction LED shows whether the screwdriver is in forward or reverse mode when screw driving. Softgrip: The PSR Select comes with Softgrip for a comfortable hold. The Advantages of Lithium-Ion Technology: Tools with lithium-ion technology are ready for use practically all of the time. Regardless of whether the battery is fully charged, partially charged or flat, you can put it in the charging station without having to worry about self-discharge or memory effect. Small Tools, Big Progress--Simply Remarkable: Bosch lithium-ion cordless tools like the IXO are ready for use quickly. Even after a period of 4 months on standby, a fully charged lithium-ion battery is still charged to approximately 85%. This means that Bosch Power is available to you for six times longer than that of conventional NiCd batteries. Full Power at All Times: No self-discharge, no memory effect: constant battery capacity over the entire lifetime. Always ready when you are thanks to lithium-ion technology. Same Battery Power at Half The Size: Due to the lithium-ion technology, the size and weight of the batteries are reduced by approximately 60% compared to conventional nickel cadmium batteries--although they offer the same amount of power. Batteries That Withstand the Elements: The intelligent electronic cell protection Bosch ECP protects the lithium-ion batteries against excessive temperatures and overload, giving them a particularly long lifetime. High Power, Low Weight: Bosch cordless tools with lithium-ion technology impress with their very compact design, low weight and very good ease of use. This saves you a lot of effort when doing those DIY jobs.